I am a huge list makers. If you looked on my phone right now, you’d probably be overwhelmed and confused by the number of lists I have saved. Some of which are extremely random and I don’t remember making. this is one I struggle with constantly. I am always worrying about if people think I’m faking it, or exaggerating my pain. I worry if they think I’m just lazy because I turn down opportunities to go hiking, when really, it would make my head near explode. I worry that people will think I’m no fun because often I have to turn down happy hour invitations because alcohol causes my head to scream. I also always worry that when people see me dancing around and laughing, that they will think I’m “better” and that I don’t have a headache. When in reality, I always have a headache, I just often put my personal enjoyment ahead of them and often put up a front that I’m ok. Just like any other thing in life, we cannot put our focus on how others view us or think of us. What matters is what we know to be true and how we see ourselves. so often I hit dark days when I worry about my life in the future and that I will be feeling sick every day for the rest of my life.These days often entail gloominess and the blues. It’s normal to have these types of discouraging thoughts, especially on days when our pain is at its worst. Do not condemn yourself for these thoughts. These thoughts are not permanent. The blues shall pass and the light will shine through again. It’s extremely hard to turn down offers to activities that we know will make us feel like the healthier people around us. I remember countless times where I have accepted offers and pushed my body just because I didn’t want FOMO. But, each time without fail, my body ended up paying for it later on. In the moment, it’s easy to forget about the pain. Sometimes, I even forget that my headaches are there due to my excitement or adrenaline. But once I stop moving, trust me, they remind me that they’re still there. The pounding in my head is usually so bad I almost (and likely do) cry. Don’t push your body past its limits. Sometimes on special occasions, if we feel comfortable knowing we will most likely pay for it later, it’s ok to say yes when we know we shouldn’t. But overall, it’s important to stay mindful to what your body is telling you. this one stuck out to me the most. Almost every day I think to myself “I just wish I could feel like I did x years ago when my headaches were not a constant.” I daydream about the days where I was exercising daily, partying like a normal young adult sometimes does, and just living life without worrying about setting a reminder for my 3 doctor appointments for the next week. But the thing is, life is always changing. What once brought us joy may not bring us the same kind of joy any longer. Take a look at where you are now, what you’ve accomplished and who you have around you. Ask yourself, did you have these things in your pre-illness life? Most likely, you got to where you are today because of what you went through in the past. And I bet all of you have some really great accomplishments to be proud of and a lot of people who are there for you day in and day out. Put that life on a pedestal. If you’re like me, than you are your own biggest critic. People like us have a tendency to be hard on ourselves and have a very tough time letting things from the past go. Let’s make a promise to ourselves to focus on the good that we have in our lives now, instead of fretting over what we’ve lost from the past. Pain. We all feel it. It could be short lasting or seemingly never-ending. We get hurt, we cry, we heal. My pain is constant. The throbbing sometimes has mercy and I feel “fine.” Other times, it’s relentless and merciless. This past week has been a week of the relentless kind of pain. On my good days, I go to bed with a headache and wake up with one, but on my good days I am not bothered by it because the pain is so minimal that I’m able to wake up with a smile. On my bad days I go to sleep with a 7/10 headache and wake up with a 7/10 headache, or worse. I’ve been having more bad days than good, lately. It’s extremely frustrating. It’s more frustrating than people can imagine. It’s so frustrating that sometimes, it’s all I can think about. I can be with my friends, and I’m thinking about how my pain is never-ending. I can be in church, and I’m dozing off to think about how my pain won’t let up. It occupies all of my mind and energy. It bums me out when I have to cancel plans because I feel crappy. It bums me out even when I didn’t even have plans, but I know that I’ll be staying in even if I wanted to make plans. It bums me out to know that I’m no where near as healthy as my peers and even so, no where near as healthy as I, my chronically ill self, have felt before. It can be hard to go to sleep and tell yourself to begin the next day with an open and optimistic mind, when every day feels like the same broken record playing over and over again. This pretty accurately describes the majority of a spoonies life. A confused jumble and medley of things. Symptoms (and more) are so unpredictable. One day we might feel great and the next day we may feel like we cannot even fathom getting out of bed. Treatments are also unpredictable. Some treatments work, even if only a little bit, and some treatments work so poorly that they may even make our symptoms worse. Life is a rollercoaseter for everyone. Ups and downs, unforeseen curves, etc. For people living with chronic illness or disabilities, life is a completely unstable rollercoaster. 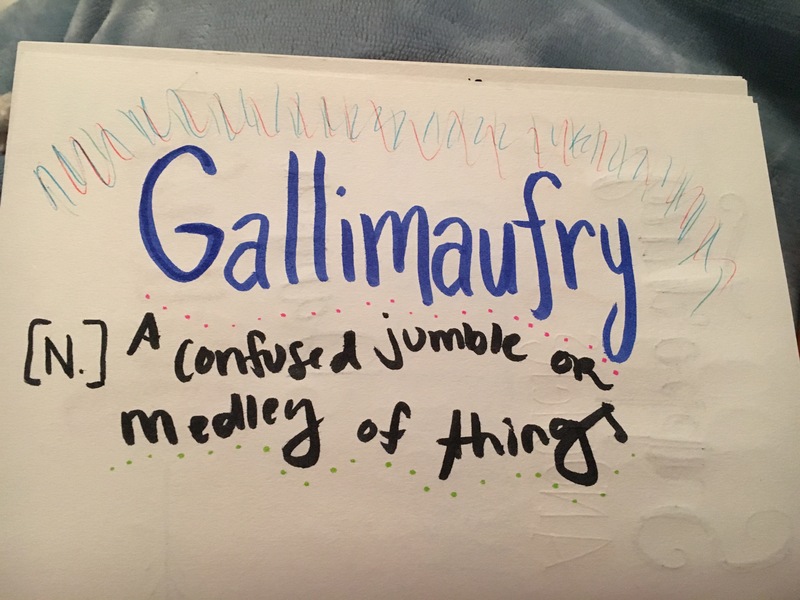 It’s a gallimaufry. Vote For The Headache Heroine in the 5th Annual Health Activist Awards! Please take a quick minute or two to vote for me on my nominee profile! I truly appreciate all of the support and am very humbled and excited to even be thought of for these awards! It’s extremely touching and motivating to know that I’ve at least reached and helped one other person over the past year through The Headache Heroine. It wasn’t planted in a bed of full soil among other lucky seeds. It wasn’t given what others were blessed with. It was born an underdog. I was not built to live in a fully healthy body like so many others around me. I was handed cards that others have been blessed not to have received. I was born an underdog. It grows within muddied waters and it has to push its way out to get some light in its life. I continue to grow despite each new obstacle that life throws my way. I push my body to whatever helps it feel healthier. It reaches the light, blossoms and thrives despite its unfavorable beginnings. It is a Cinderella story. 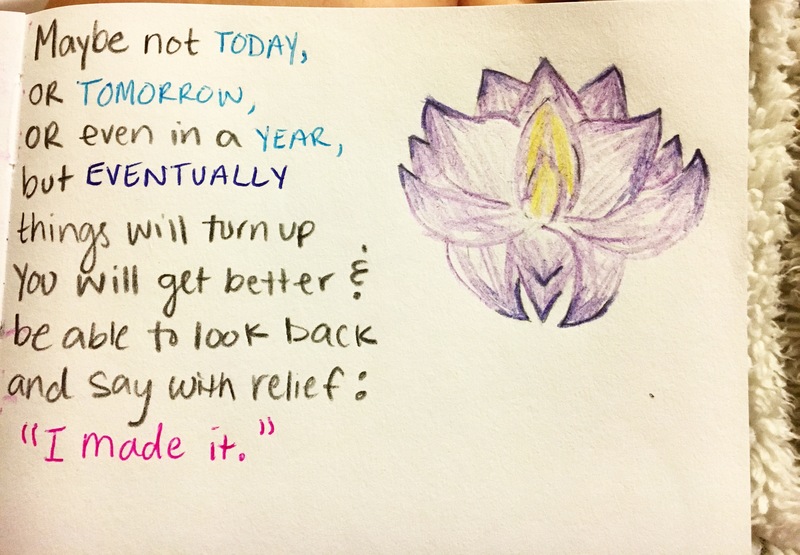 I push myself further and harder each day so that I, too, can blossom. So that I may reach my sun and come out on top, despite the unfavorable circumstances I’ve been given. Despite the never ending headaches and the on-going speed bumps in my journey to find treatments that help. Despite the wear and tear that my heart, mind and body have undergrone throughout it all. I will become the Cinderella story.